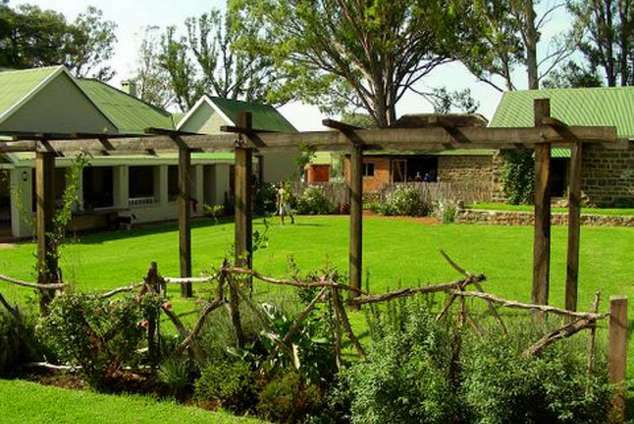 Dalmore Guest Farm B&B - Bergville Accommodation. Enormous lawns, a large pool and a variety of fuzzy furry farm animals are an endless source of entertainment for kids of all ages. Bordering on the Spioenkop Dam and Nature Reserve, the farm, home to a great variety of bird life, offers many activities for guests to enjoy. Paddling, fishing, sailing, hiking, superb mountain biking or simply picnicking in the shadows of the willow trees is a great way to spend your day. We are privileged to be a part of the awesome Berg and Bush Mountain Bike Race and as such, have some truly spectacular routes available. Situated midway between Bergville and Winterton, we are a half hour drive to most of the Northern and Central Drakensberg Resorts where one is able to golf, white water raft, abseil and experience spectacular berg hiking. A 5 minute drive lands you in the Spioenkop Nature Reserve boasting white rhino, giraffe, zebra, kudu, eland and a vast number of smaller antelope. Guided horse rides on offer in the reserve allow for a fresh and unique perspective on game viewing. Dalmore Guest Farm is a place where you will always be ensured a cold beer in summer and a warm bed in winter. 56069 page views since 18 Feb, 2009.